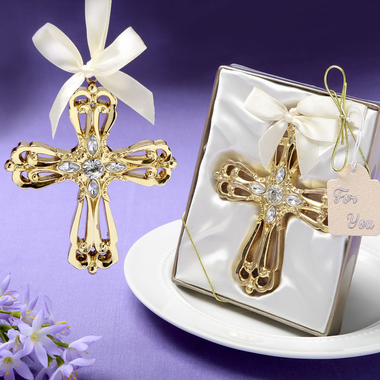 Let the brilliance of these intricately detailed gold cross Christmas ornaments illuminate the hearts of your loved ones, when you gift them as party favors at your religious celebration. Crafted in polyresin with a stunning filigree design and encrusted with crystal rhinestones, each ornament measures 4 1/4" x 3 3/8". There is an ivory satin ribbon tied to the top to hang the ornament. The crosses are neatly placed within a white satin frame inside a clear display box with golden base, and have a white bow and golden ?For You? tag.